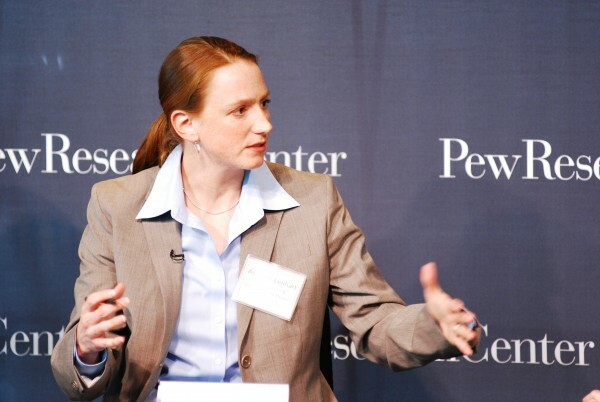 As senior research specialist at the Pew Research Center’s Internet and American Life Project, a nonprofit, nonpartisan research organization based in Washington, D.C. that studies the social impact of the internet, Amanda Lenhart is known as one of the most thorough yet succinct researchers in the field of adolescent technology use. She has been with the Pew Internet and American Life Project since its inception in 1999. While working with youth in afterschool settings in the late 1990s and early 2000s, Lenhart observed that youth were using important technologies in creative and unusual ways that were different from the ways adults were using them. Since then, she has turned her focus to teens, social networking, and web 2.0, and over the past year, she and her colleagues have released several reports that have been widely circulated throughout the digital media and learning community. We spent a few moments speaking with Lenhart to get some quantitative responses on topics that have recently become hot-button issues in mass media and within the DML field. For the “Teens, Kindness and Cruelty on Social Network Sites” report, you chose not to lead with the term “bullying.” Has the word become problematic? There has been a lot of research and media coverage around the concept of bullying and cyberbullying, and we wanted this study to be able to speak to that, but through our own focus group work and through other qualitative work from experts such as danah boyd and Alice Marwick, we knew the term bullying was not really resonating with all youth. An alternate term “drama” was much more widely recognized, and when asked to describe it in these qualitative research moments, youth often described what we would call — as adults – bullying and ascribed this term drama to that. It became clear that the term bullying wasn’t doing all the work that needed to be done to fully understand what was going on in this digital space. We did keep the term bullying in one question we asked because we knew that for some youth, that was the term they would want to use. They want to ascribe that almost adult conception of this repetitive meanness and cruelty to their own experience. But ultimately, we hit upon the concept of “meanness and cruelty” – knowing that it is not a perfect measurement, but it does get at essential behaviors that teens would recognize when we used those terms. They are words that mean something to youth and that would elicit a fuller understanding of exactly what kinds of experiences youth were having on social media and draw out a greater nuance in the negative experiences youth were having that the term bullying would not. Middle school girls are most likely to describe social networking sites as unkind places, yet this group is often the first to experiment with social media. Can you unpack this dichotomy? Middle school is a great time for social development. Middle school girls are right at the beginning of their enthusiasm for social interaction, more so than many boys of the same age. These are the general tendencies that we see. It is a learning process in the halls of their middle schools just as it is in the digital realm. The learning curve can be steep, which I suspect is part of it. The desire to be social comes into play around 12-13 for girls — even younger for some — but newness to the space can bring a greater likelihood of unfiltered communication. Middle school girls’ social dynamics, which are often focused around status, friendship and self-identity, are getting played out in these digital spaces. When you overlay that with a loss of cues in the digital world, e.g. tone of voice, body language, and all of the other non-verbal cues that we give robustly face-to-face that can sometimes prevent us from saying and doing very hurtful things, these online interactions can cause misunderstandings and drama. This is partly why girls may be reporting a greater experience of unkindness in these spaces. “Teens, Smartphones & Texting” shows teens are now sending upwards of 100 text messages per day. Is this having adverse effects on their ability to socialize face-to-face? The debate we are having in the media now is one that is played out to a certain degree in our focus groups among youth as well. There were some youth that felt both overwhelmed and empowered in the way their mobile phone constantly connected them to friends. They acknowledged this connection was a good thing under certain circumstances but that at times it could be very tiresome. 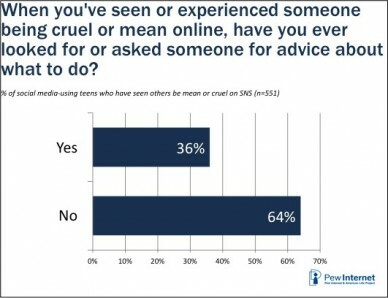 Teens also spoke about their mobile phone as being an electronic leash that tethered them to their parents in ways that they found uncomfortable, even as it allowed them to have greater physical freedom. There were many youth who felt vastly better connected to those people in their lives who were close to them – whether that was a grandparent who lived several states away or a friend from a summer camp. Teens also value the ability to get access to information when they want it and when they need it. They talked about the ways in which their mobile phones were really indispensible in making them feel safe, connecting them to friends and social experiences, and how being without that connectivity was harmful. At the same time, they use the devices to communicate in many ways, with many different people in their lives. Sometimes this communication can result in misunderstandings because, again, these rich non-verbal cues are missing. So much of it really depends on the teen you talk to, but I think youth would tell you that they are choosing these ways of staying in touch because they mostly appreciate and enjoy the ways in which it connects them. I don’t think they would tell you that they think their communication is somehow lesser from it. Teens still do communicate with each other face-to-face every day in school and out of it, and tell us in our qualitative work that they still prefer to spend time with friends in person whenever they can. Digital communication is now firmly a part of teens’ communicative arsenal, but face-to-face communication remains hugely important as well. Does the challenge of managing an invisible audience get mistaken for a lack of concern about privacy issues? rofiles set to private so only their friends can see their content or the 55% of online teens who have decided not to publish content that might reflect poorly on them in the future. One of the great challenges with social media is that earlier choices persist. Not very many of us as adults have a really robust record of some of the unfortunate choices we made as adolescents, but today’s adolescents do and will. Additionally, you can believe that the people in your network are your friends, but sometimes content does get lifted out of these seemingly closed networks and gets shared more widely. We have also learned from our focus groups that some youth feel pressure to add people to their social media network, and as a result, it becomes almost a reproduction of their school. They feel like it is mean to not friend someone so they will accept any request even if they only know the person vaguely. So it is important to remember that some youth have created networks that are not that private at all. 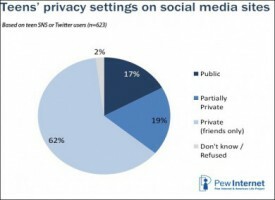 Plus, for many youth, they know how to use social media sites to interact and connect with others, but they don’t always “look under the hood” and may not have a nuanced understanding of how the privacy settings really work. From whom do they receive support when sorting through these difficult issues? 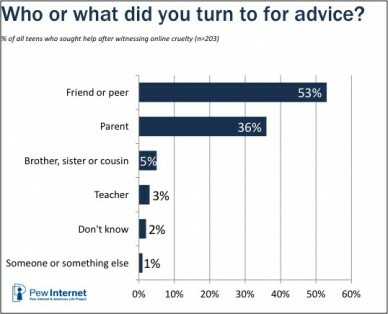 Teens acknowledge that they are receiving advice about how to be good citizens of the internet from a range of sources. There are many people in teens’ lives who have great potential and do make an impact. I think that is so very important, and I really love this idea of looking at the whole child across his/her whole life and making sure he/she is nurtured and taught and escorted through the technological difficulties of adolescence by a large variety of people. It’s important to note that teens go to certain people depending on the situation at hand. If there is a specific social concern arising in social media, they are more likely to go to peers, which is not surprising as it is age appropriate. But it’s important to note that parents really do shape a lot of teens’ values around how they behave in online and offline situations. Parents do matter, even though teens don’t always want to admit that. We have to make sure that all of those people in their lives who give teens advice on how to use digital technologies have tools at their disposal so that when situations arise, they have information to give to teens. It’s not just the home or the school, but it’s also the “third places” in teens’ lives — like a friend’s house, youth group meeting, sports practice — where they are being influenced and gaining advice. What set of findings over the span of your career has most surprised you? There have been many throughout the years that have been pretty surprising. More recently, it’s been amazing to see mobile becoming a real leapfrogging technology for those folks who were less connected or unconnected from the internet. Particularly powerful has been seeing the ways in which that moved into the minority communities and lower-income communities and how it has brought the promise of the internet and information to those groups. Initially it was a finding that we might not have expected given the previous half-decade of the digital divide and the ways in which people were disenfranchised through lack of internet access. You can go back 10 years and look at the people who lacked access to information and connection through digital technologies and see the ways in which mobile phones have really begun to change that for many groups. This doesn’t mean that all the divides and inequalities have been erased, but mobile has brought a lot of promise and evidence that people want information, they want to connect, and once they have opportunities and the tools to do so, they will.